September 2009 | Tired, Need Sleep. This week we began our autumn theme! I’m very excited about all the great activities and learning tools available with this theme. We did our ABC train in the pocket chart again. Right away, when M saw me setting it up, he said, “I don’t want to do that, I didn’t do so good with it”. :( I told him that we were going to do it a different way this time and that he would do great. I sorted the train cars out on the floor by color, and then told M which letter we needed and which color group it was with. Each color had only 4 to 5 cards, so it was really simple for him to find the one we needed. He did great! His favorite part was after the train was put together. He grabbed two pencils and we pointed to each letter while we sang the ABC song. I’ve got to remember to always set him up for success while still challenging him. It went so much better this week and he felt much better about his abilities than he did last week. M practiced his sawing. :) He lined up his blocks and sawed them apart, one by one (making all the appropriate chainsaw noises – you did know that’s a chainsaw, right?) : You can see we aren’t getting very far on the road to cleaning one thing up before starting another. Sigh. 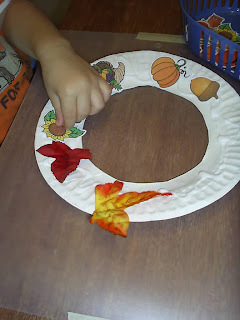 For our autumn theme, we did a sort of circle time activity a few days this week. First, we talked about all four seasons, and what changes take place during each one. I found these great seasonal clothing cards at Montessori for Everyone, and we set them up on the pocket chart and talked about them. I plan to use these at some point for sorting too. I put different colored star stickers on the backs of these so when we sort them M will be able to tell if he sorted them all correctly on his own (blue star for summer, purple for winter, green for spring, orange for fall). I found some fun seasonal clipart at Kizclub and we sorted them out onto colored paper. Green for spring, blue for summer, orange for fall, and red for winter. M did pretty well with this. He had a little trouble with summer and spring items, but in my opinion some of them were a little confusing. Two little feet to walk His ways. I’m not sure who wrote this, it is in one of M’s baby books. I’m trying to bring something more about faith/religion into our time together on a more daily basis. We pray at mealtimes and bedtime, read Bible stories, and do our (somewhat sporadic) Sunday School lessons, but I feel he’s ready for more than that. I hope you all had wonderful weeks with your tots! 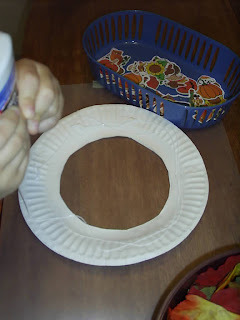 Check here for more tot school ideas. 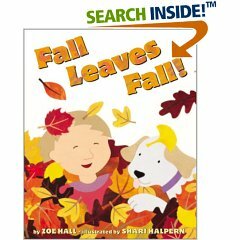 More books about autumn this week! First – Red Leaf, Yellow Leaf by Lois Ehlert. In my opinion, pretty much any book by Lois Ehlert is a winner. :) This one is no exception. The book describes the leaves and seeds of a maple tree, as well as what the tree looks like in each season, and describes how seedling trees are gathered, brought to nurseries and sold so people can plant a tree of their own at home. The pictures are lovely works of art, textural collages using fabric, ribbon, and a variety of other materials. We have a sugar maple tree in our front yard, so I was super excited about this book! I’ve read it once with M, and he was interested, but some of the information may have been a little over his head. Next – Up, Up, Up! 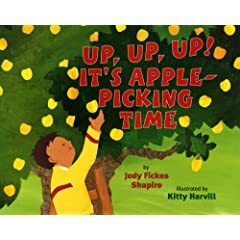 It’s Apple-picking Time, by Jody Fickes Shapiro. This is a sweet, warm story about a family who goes apple picking together. It describes the sounds and scents of the orchard and the feel of partaking in a family ritual. We are lucky to have our own apple orchard (it feels bizarre to even type that) on my husband’s family farm, and I want M to have all the wonderful experiences the boy in this book has. This is a very feel-good cozy book and I love it. I haven’t read it to M yet… I’m waiting for our apples to be ready for picking sometime in October before we start too many apple activities. I’m sure he will love it. 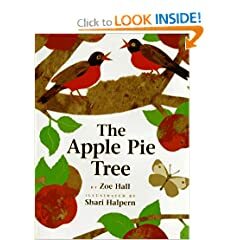 Lastly – The Apple Pie Tree, by Zoe Hall. Zoe Hall’s books are all highly recommended! I had never read this one before, but I really like it. Two young girls have an apple tree in their yard and they watch it through all the seasons, until time for apple picking and making pies. It’s a great story and a very cute part is the family of robins that live in the tree, going through their own stages of growth as the tree goes through the seasons. I think this book does a great job of describing the life-cycle of apples and I will be using this with our apple life-cycle cards. I hope you are all enjoying some good books with your little ones! Go here for more reviews. We’ve been working on setting up a new routine here this week and there’s still a lot of adjusting and fine-tuning to do. Setting aside a large amount of time for “school” one day a week just isn’t cutting it for us right now. We’ve been trying to make sure to spend one day per week at home, which I feel is reasonable, but I’ve been trying to get all the house-cleaning done that day, set aside a large chunk of time for tot school, and stuff in a bunch of other items from the never-ending to-do list… and I’ve been left feeling pretty… well, crabby, to be honest. Stressed, exhausted, unhappy… that’s just not the mood I want to be in when M and I have special time together. The other part of the plan is to then have 20 to 30 minutes a day of what I’m calling “circle time” in my head. I don’t know what I’ll call it when talking to M; circle time sounds a little funny when it is pretty much just he and I! But it will be time for a story, one or two activities, poems, songs, flannel board, etc. I plan to make our weather chart part of this on a daily basis, sense we’ve gotten away from doing it. Also, we will add in prayers, character building lessons, learn the days of the week, and maybe a game once in a while. I think I will have it all revolve around certain themes. The current theme is autumn, and I’m thinking there’s enough resources out there that we could easily do seasonal and holiday themes for a very long time! We’ll either try to do this in the mornings or after nap time, before it’s time to start cooking dinner. M rarely takes a nap any more, I just have him rest for a while after lunch – this is when I let him watch a little TV (usually a dvd of Clifford shows or something along those lines), or sometimes he sits in bed and looks at books. I’ve thought of doing our “circle time” after lunch since it would be easy to fit in then – but after trying it a couple of times I’ve found it to be disastrous. He may not need a nap, but I definitely need a break of some sort at that time of day. That is my energy low point and I need to take that time to rest, focus on something else, and just recharge my batteries. We’ve got a busy fall ahead of us – Mondays we have a pray/play group with a bunch of moms at church, then we run errands before lunch; every other Tuesday we will have a class at our local nature center (“playful polliwogs” – isn’t that cute? ); Thursdays we’ll alternate between story time at the library and another church pray/play group at various moms’ homes; Fridays will be our days for field trips or play dates with just one or two friends. There’s also some activities at the local community center scattered throughout the calendar that we want to go to. Whew. I hope we can manage it all… and I hope that if we can’t manage it all I will have the presence of mind to rethink things and say no to some activities. It’s hard to do, isn’t it?!?! So, just thought I’d spell it all out here so I have a record of my plans, and maybe I’ll even get a few great suggestions! Feel free to tell me how you get things done and still have time for your child(ren). I’ve been doing a lot of online searching, printing, cutting and laminating the last few weeks, getting ready for autumn activities with M. Fall is my very, very favorite season (like the new look of the blog?) and we are going to be having a lot of fun learning over the coming weeks. I ran across a great online Autumn Tic Tac Toe game at DLTK, and fell in love with the cute graphics of the pumpkin and leaf. I wanted to turn it into a hands-on game to play with M, and I was graciously given permission to publish it on here for you to download and print too! (Thank you to Darren at DLTK!) It’s very simple, but I think it appeals to small children. The download for the printable game is here. The online game, for those of you whose children are already using the computer, is here. This week we worked on how letters are formed (M constantly wants to draw letters) and the order of the ABCs. He knows the song, but actually putting letters in order is another matter all together. We used our pretty glass pebbles and cardstock letters (both from Dollar Tree!) to practice forming letters correctly. We worked on as many letters as he wanted. I told him to start at the top, bottom, or wherever, and how to form them as if he were going to actually write them. He really got into this and we did about 6 or 7 letters before he wanted to move on to something else. We did an ABC train activity with our pocket chart. I found the ABC cards here, and the idea for how to use them was from Little Hands, Big Work. We sang the ABC song a couple of times, then we tried singing it very slowly and stopping at each letter; the idea was for him to find each letter and place it in the pocket chart. Right away he became a little frustrated. I think the way we had the cards lying on the floor was a little overwhelming for him. It’s a shame that this turned out to not be fun for him because he was really, really looking forward to doing something with the train when he saw me cutting it out and laminating it. I should have put more thought into this and separated them by color so I could give him hints to help find each one. But, in the end, I put them all in the pocket chart and we just had fun singing the song and pointing at each one. We did that several times. Then later in the day I found him with a pencil pointing to each letter and singing, and that made me feel much better! We did his transportation same/different cards, and he did fantastic. He’s done these before, but this time I asked him why the different one was different and he was able to give me a clear answer each time. And he’s been calling this little teddy bear his “baby” all week. We’ve had a lot of friends with new babies lately and I think he’s got the baby bug. :) Here I found him rocking his baby: Gosh, I sure do love this little boy! We did this for a quick and simple art project this week. We haven’t done much with foil, but as I was wrapping up something to stick in the fridge, I thought about how much fun it would be to use for art time. So we got out the foil and some markers. I said it was quick and simple! We talked about how shiny, almost like a mirror, the foil is; how smooth it is; and how interesting it sounds when it moves. M enjoyed using his regular markers, and then we tried the window markers. I preferred the window markers (yes, I was drawing a little bit too). M loves the white window marker because it’s so unusual to have a white marker, so he used that one a lot, but I think he liked using both kinds of marker equally. We’ve been running pretty low on paint and *making do* for a few weeks now. Finally, the paint drought is over. :) M was as excited as I was, and ran for the kitchen and the paintbrushes. He grabbed the tiniest paintbrush we have, and painted an (almost) entire sheet of newsprint… blue. It was at this point that he said his arm was starting to hurt, and I finally had him switch to a bigger brush. :) I had no idea the poor kid had felt so paint-deprived lately. Then we did some quick crabapple prints – this was for me, because I’ve been seeing all the apple crafts out there in blogland lately and they are making me so anxious to start our fall theme. I was standing firm about not starting until fall is actually here, but then Daddy and Matthew brought home grocery bags full of crabapples from Grandpa’s farm and I knew we just had to do something with them. Ah, Paint, how we love you! I’ve been preparing an Autumn theme of learning activities recently, and so I thought I’d share three of the books we are going to read to get us started! We love all of Lauren Thompson’s books and this one is no exception. 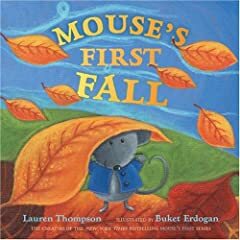 I believe there is a “Mouse” book for every season, and I plan to check the others out too at some point. In this book, Mouse discovers all the beautiful colors of leaves, their textures and shapes. He has fun running, skipping and kicking his way through them, piles them up and then… well you can guess what happens with a happy little mouse and a big pile of leaves. :) It’s the same thing that happens with a happy small child and a big pile of leaves. ;) This is just a really delightful book to read and I am so glad we found it. This is written in the voice of two children who watch autumn arrive as the leaves begin to change colors. They talk about all the beautiful colors, the shapes and sizes of the leaves, try to catch them, stomp and crunch them, and watch them fly through the air. They collect some leaves (an idea I love) and examine them. They rake them into a pile and jump in. This book has great illustrations of leaves, which are labeled with the type of tree they came from. We will be learning about just this thing and this book will be a great addition to our leaf identification project. This book also has a cute idea for making pictures with the leaves. You have to check this one out – it’s definitely a favorite! 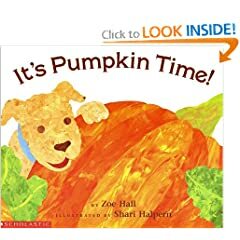 This is essentially a Halloween book – the favorite holiday of the two characters - and it has a great lesson about the life-cycle of pumpkins. The children plant the seeds, water them, watch them grow into vines with flowers, and then green pumpkins which slowly turn to orange and are ready to be picked, carved, and have more seeds inside to plant next year! Halloween is mentioned, but thankfully, nothing scary or spooky is in this book. We try to stay away from that kind of thing because I have no desire to be up at all hours of the night with a little boy whose imagination is working over time… but I digress; the book is great and I plan to use it along with some pumpkin life-cycle cards. And if you have a small child who isn’t sure what Halloween is exactly, this is a good introduction – it talks about costumes and trick-or-treating and is a fun book to read! 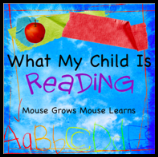 Go to the MckLinky at Mouse Grows, Mouse Learns to see what other kids are reading!